"Taiwan's New Approach: Opportunities and Challenges for President Ma Ying-jeou's Government"
"Hugo Chavez y la Realidad Venezolana de Hoy"
A talk by Teodoro Petkoff, prominent Venezuelan politician, journalist and economist. 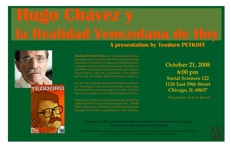 From the Center for Latin American Studies. Wim Wenders on "The Goalie’s Anxiety at the Penalty Kick"
The Gastrointestinal Research Center was established to focus on improving understanding of the structures, mechanisms and functions of the gastrointestinal tract in animals and humans.